Here is a peek at the sunflowers I designed and am currently embroidering. I am embroidering on a painted dryer sheet. I just think it is really fun to be able to paint the background for my embroidery. 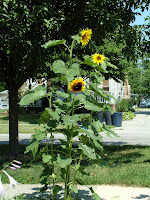 Here is also a picture of the sunflowers that inspired my drawing. These are growing on the edge of our front yard. My husband, Andrew, planted them with the girls earlier this summer. They stand about seven feet tall at the highest point. The Yellow Finches (also known as wild canaries) love the sunflowers. I have been trying to get a good picture of them perching on the flowers but I have not been very lucky. I have also posted a couple of pictures of some flowers I took the other day while out with the girls. My parents discovered this wonderful park about twenty minutes from our home. 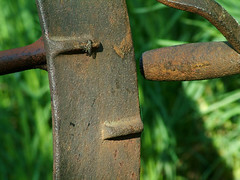 It is part of the Lorain County Metro Parks and was at one time a private arboretum. It's a wonderful place, I can't wait to take some more pictures there. Hope you enjoy the flowers. I think this flower is a Zinnia. I know it is not a Gerber Daisy. 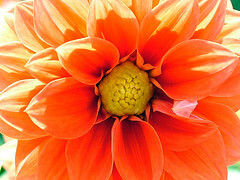 This one happens to be orange but there were also plenty of yellow and red ones blooming as well. The wash of color was so pretty. This park had a little bit of everything. The children's garden was wonderful! Complete with a watering garden and a working merry go round. The girls absolutely loved it! I can't wait until Fall when all of the leaves are changing colors. I will be back to take more pictures. The park had numerous flower garden displays scattered all over. I think every color of the rainbow was growing! I snapped this photo of some pretty blue/purple Hydraingias just as it was starting to rain. I decided that I liked doing the first embroidery project so much that I would jump right in and do a second one. 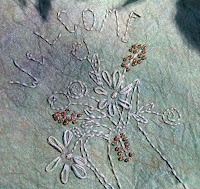 This pattern is also from the book "Modern Primitive Embroidery" by Jennie Baer. I am normally not a fast craft person. It usually takes me quite a while to finish any project. Take knitting for example; it takes me weeks and weeks to finish a baby blanket. Embroidery however, goes by fast! I can take it outside with me when the girls are playing and I don't have to worry about counting stitches or reading a chart. It seems like the perfect medium for someone like me: an over indulgent mother who has two very demanding little girls! (I know, if I wouldn't over indulge they wouldn't be so demanding!) I'm going to try my hand at designing my own pattern next. Something simple I think like just a couple of sun flowers. Wish me luck! Yes I have embroidered on a coffee filter. I have been experimenting with different ways of making hand painted backgrounds for my craft projects. I have tried brown paper bags, dryer sheets, and now coffee filters. 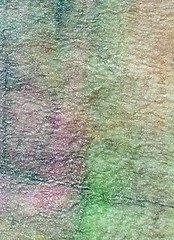 Although I like the differen textures of all of them, my favorite for embroidery is the dryer sheet. The coffee filter looks nice and accepted paint really well but the dryer sheets are much more "cloth like". The coffee filter is more like stitching on paper. This was fun though and I will definately try it again. I don't mean to cut this short but I do need to go because as I write I currently have four young kittens trying to use my legs as a climbing wall! Have a great week! Well here it is! My first real attempt at embroidery. I must prefice this with the fact that I am not new to floss and needle. 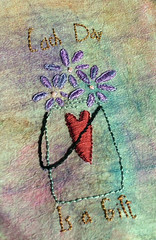 I used a pattern from the book Modern Primitive Embroidery by Jennie Baer. Eventually I would like to try my hand at drawing my own design. I did not use the colors recommended in the book. I went to my stash and pulled out colors that I thought complemented the dryer sheet. I must confess to being a floss snob. I love using over dyed and hand dyed varigated floss. 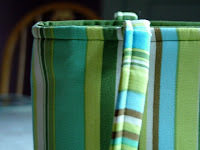 It just gives whatever project you are working on such a home spun, individualized look. 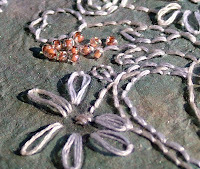 Hope everyone has a good week, I am off to try some more embroidery! I decided to use beads for the center of the flowers rather than French Knots. I have yet to master the French knot so I decided to go the easy route and just add the beads. 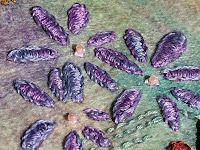 I also liked the texture that the beads added. I'm not sure how I'm going to finish this yet. I was thinking about trimming it and sewing it to a piece of purple cotton fabric that I have. I have started another one for my Aunt Tracy. 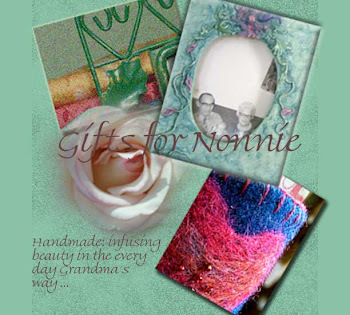 She is having hip surgery in August and I think something nice to spruce up her hospital room will make the whole ordeal more bearable. I will post pictures of that one when I am finished. Have a great day! 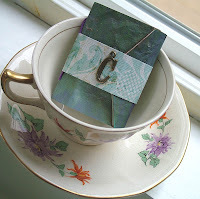 Last week the girls and I made some more hand painted paper from old brown bags. (50/50 glue and whater, dip your bag, then pull it out and paint) About half way through I realized we didn't have anymore bags. So we improvised and used dryer sheets. They turned out great! The only additional thing I did was after the dryer sheets were dry I ironed them to a piece of fusible interfacing. The dryer sheets were fragile, the interfacing gave them some stability and body. I tried to be extra environmentally friendly and use "used" dryer sheets but it just didn't work. At least the new ones won't be going into the garbage! 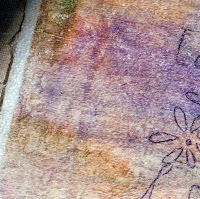 About two months ago I ordered a Leisure Arts book titled "Modern Primitive Embroidery" by Jennie Baer. I've wanted to try embroidery for a long time. 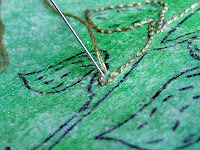 I have been an avid cross stitcher since junior high school but have never tried embroidery. I decided that the hand painted dryer sheet makes a perfect canvas to finally try this wonderful needle art. I am currently about halfway done and am really excited at how it is turning out. I will gladly post pictures when it is finished. Have a great day! About seven years ago I was at the Saint John West Shore Festival of the Arts (SJWS Hospital in Westlake, Ohio holds a large juried art show every year-it's big.) and I bought a purse from a designer/artist from Toledo. Her name was Tara Hubbard. I loved that purse, and every year I would return to the SJWS Festival of the Arts hoping to have the opportunity to buy another purse. Well Friday night was my night to finally get my chance. I wasn't even paying attention; my sister and mother were at her booth and I walked over there to see what they were looking at. When my sister showed me an adorable brown and pink bag she liked I noticed the inside label... Low and behold it was the designer/artist I had been looking for during the last six years! And get this, I was using my original Tara Hubbard Handbag! For any of you that love purses, good ones, that are in a reasonable price range, and are adorable and made well (I could go on and on!) 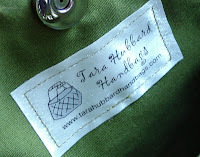 visit her website at http://www.tarahubbardhandbags.com/ I will be posting a badge with a link some time tomorrow. But for now enjoy the pictures of my new bag! Have a great day. 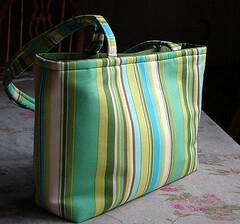 Here it is my second Tara Hubbard Handbag! It only took me almost seven years to find her again. I love this bag as much as I love the first one. Both bags I have don't look very big but they carry a lot. I had both Fiona and Alexa with me when we ran errands today and by the end of the trip this bag was loaded! Not only did I have my own stuff in there but I had two stuffed lady bugs, a bitsy baby doll, and two (yes two) 16 oz bottles of water, and the purse still closed! 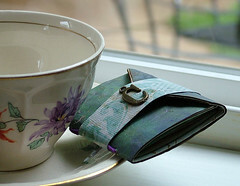 Now that is the test of a good purse. This week's color for Shades of Inspiration is brown. This is our dog Hailey. 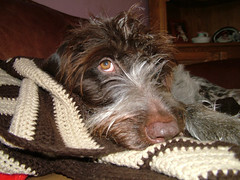 She is a seven year old German Wire Haired Pointer and is a 106 pound baby. Here she is lying on the couch with her favorite blanket. My Aunt Diane crocheted the blanket for me as a Christmas present a couple of years ago, every time the blanket is out Hailey is lying on it! This is the best dog in the world. She is a gentle giant and gallant protector when it comes to Fiona and Alexa. We love her! About two or three weeks ago I downloaded this mini book template from Jessica at Lost Button Studio. 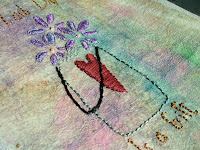 You can get the template from her blog at http://lostbuttonstudio.blogspot.com/ This was such a great little project and the template and instructions were very easy to follow. It took me a couple of weeks to complete as I would work on one page a night. 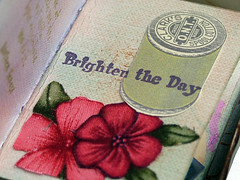 I used some of the hand painted paper that I made with Fiona and Alexa for the outside of the book. I chose a coordinating printed paper for the band around the book and embellished it with my initial (small brass charm). 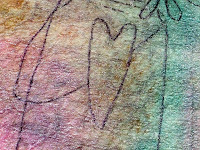 For the inside of the book I used water color paper. 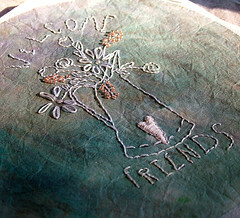 I sewed the book together with a contrasting embroidery floss. I wanted each page just to be a little collage of inspiration. Just something to inspire me and make me feel good. This was the first time that I made something just for the sake of making something. It was a lot of fun. I love this quote and it is very true. If you don't have your dreams, than really, what do you have? 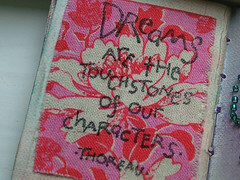 Our dreams and hopes make us who we are. This mini book was a great way for me to put some of my favorite quotes in one place and be able to carry them around. 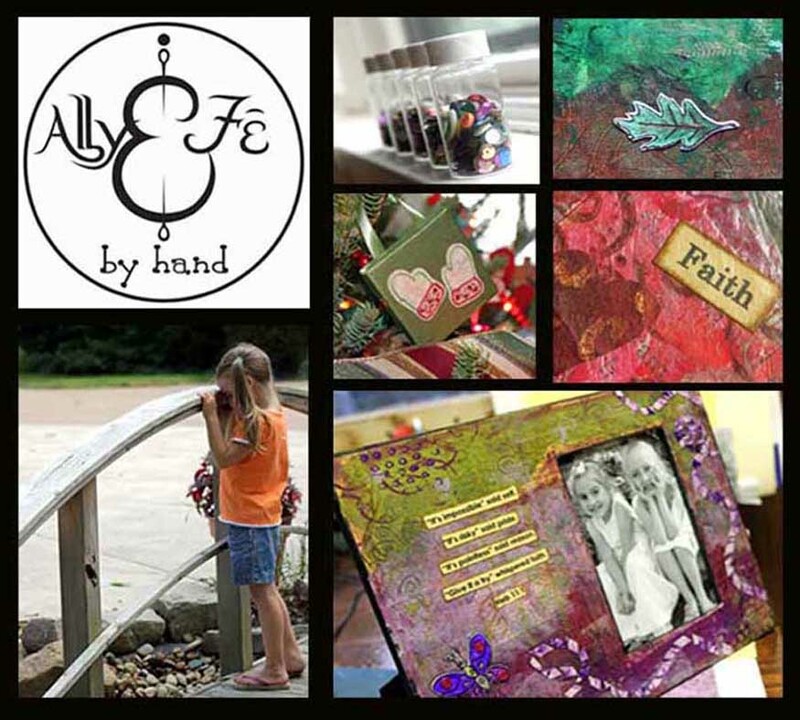 I created this page to remind me how much I like to mix paper and fabric. I also like the way the spool of thread reminds me of my grandmother. I really feel that it is very important to keep things that you love close to you. A tiny little book for a bit of inspiration. A little inspiration that I can carry around with me. This little book fits perfectly in the small inside pocket of my purse. It's dainty and cute and it makes me feel good. It reminds me that yes, at times, I do actually get a project completed! This week's Shades of Inspiration color is pink. We've had a lot of rain here in Ohio the last couple of weeks and it rained again today. I took this picture of a flower on our back patio. 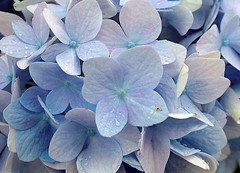 I cannot, however, remember the name of the flower! I know it is not a petunia and it is not a bagonia. It's a bit trumpet shaped and has a white center. 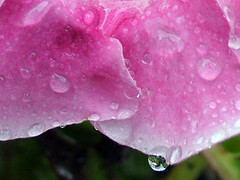 But I do know that the water droplets on it were beautiful. Nature gives us so much unedited beauty and it is really inspiring when we stop to really look at it. Hope everyone has a great Fourth of July! 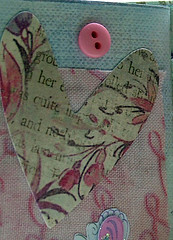 This is a very tiny pink collage from a page in a mini-book I just finished. (I still have to photograph the rest of the book before I post about it.) I did manage to take this photo for Shades of Inspiration this week though. I have a lot of pink scraps of paper and fabric lying around right now as it is currently Fiona's favorite color! 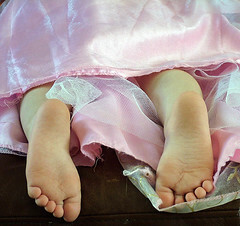 I took this picture of Alexa just the other day when she was running around the house in her pink princess dress. She flopped down across the ottoman to take a rest and I couldn't resist snapping this image of her feet. They just looked so cute lying there amongst all of the pink satin.